In this app note, we will show you how to use the DDRC-88A to apply Dirac Live® room correction in multiple rooms. In this app note we will assume that there are four stereo zones to be set up. Note: please follow the instructions below carefully. We recommend that you work fully through a single room calibration using the instructions in the comprehensive User Manual before attempting a multi-zone setup. Start Dirac Live Calibration Tool for miniDSP (DLCT). On the Sound system tab, choose a Custom System with 2 channels. On the Mic config tab, select the UMIK-1 as usual. Use the 90-degree calibration file if the microphone is to be oriented at 90 degrees to the speakers, and the on-axis (0-degree) calibration file if the microphone is to be pointed in the general direction of the speakers. On the Output & levels tab, set the output channels to be channels #1 and #2, and name the two channels appropriately. With the output volume set low to start with, click on the Test button for a channel and adjust output volume and input gain so that the meter reads in the middle of the green area. Repeat for the second channel. Proceed to the Measurements tab and perform the first measurement. The screenshot below shows the result. Proceed to perform the remaining eight measurements. It does not matter too much which type of listening area you select, but the Sofa option is probably a good choice for many situations. The important thing is to spread the measurement locations around the full listening area and to also vary the microphone height vertically. Proceed to the Filter Design tab, adjust your target curve, and click on the Optimize button to generate the correction filters. This screenshot shows the measurements before optimization, and the predicted response. Save the project. Use a meaningful name. In our case, we will use "Zone 1." Proceed to the Export tab and drag the box labeled with the project name onto the first empty slot (slot 1 shown in the example). The slot will show the project name and the names of each channel. Move the microphone to the second zone. If a long USB cable (> 5m) is required, an active USB repeater may be needed. Click on OK. Change the output channel for the second channel to Channel #4. Reduce the Output volume, and again use the Test buttons to set suitable measurement levels. Proceed through the Measurement and Filter Design tabs, as before. Save your measurements as a new project. Use a meaningful name. In our case, we will use "Zone 2." 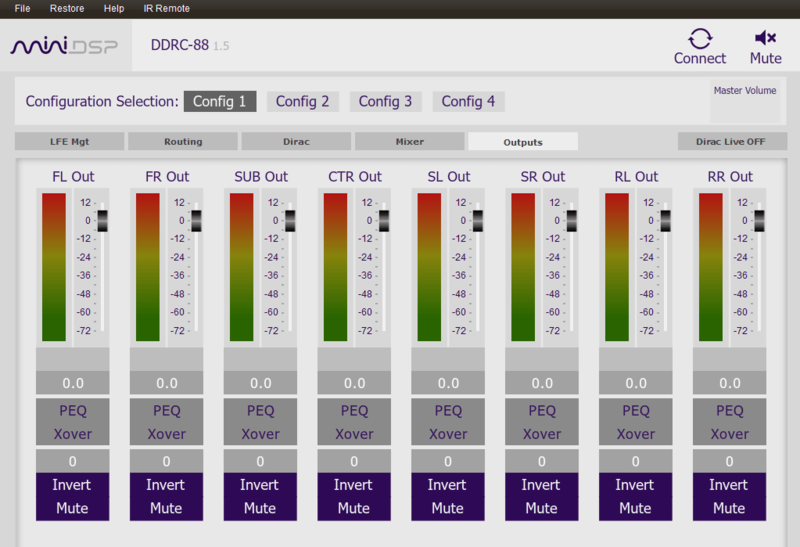 If you haven't already, turn on Dirac Live filtering and play audio. Note that the selection/switching of which zones to play through will need to be done in the source equipment—the DDRC-88A is only performing room correction for the zones, not zone switching. That's it for this app note! If you do set up multiple zones with the DDRC-88A, please let us know your experience in our forum.